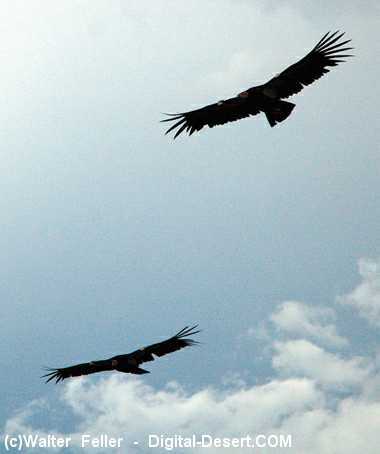 Large black raptors with a long wingspan. 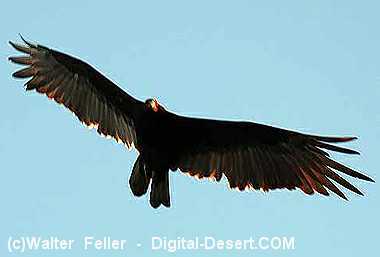 Often seen soaring in groups in high, wide circles, with a rocking or teetering flight; glides in a strong “V” shape. 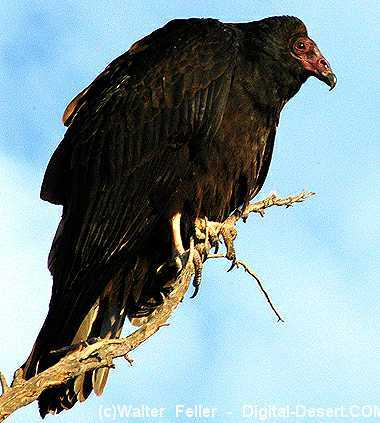 There are three species of vultures in North America, the turkey vulture, black vulture, and the California condor. These raptors are known to gather by the hundreds or even thousands to roost together. Diet consists mostly of carrion which they locate from the air (by sight and smell). They are known as "honest" foragers, meaning they scavenge for their food, using a refined sense of smell. These raptors have bare, unfeathered heads, which reduces infection when feeding on rotten meat. Studies reveal that vultures will not find carrion on the day that it is killed, but almost always find it on the second or third day when it has begun to rot, and will rarely visit a kill on the fourth day when it is in a state of full-blown, foul smell. It is thought that on the first day the carrion is too fresh to give off enough odor to be easily located by vultures; but by the second or third days, enough decay has taken place to make the kill noticeably pungent; by the fourth day, there is no doubt of the kill giving off plenty of odor to be located by the bird, but very often the quality of meat is so severely compromised by the buildup of microbial toxins, that it is no longer attractive to vultures. With the ability to sustain life on half-rotten meats, they have extreme tolerance for microbial toxins (botulism) that greatly exceeds the capacities of many other birds. Fairly silent unless cornered, then it lets out a "hiss" or "low grunt." No nest; eggs are usually laid on the ground, in caves, hollow stumps, etc. Chicks are fed by regurgitation. These raptors use their sharp, hooked beaks for tearing meat; have weaker legs and feet and small hind toes since they are not used for capturing prey.